This part is just an enjoyable morning in a lovely garden, looking for clues but no conclusion. The boundary here is lost! Here is a summing up of our morning. This is where the boundary appears to run from the fields into the side garden boundary of 25 The Ridgeway, over The Ridgeway road and along the boundary of the property opposite 25. The house is currently being demolished (and the replacement is due to feature on the Grand Designs TV programme) but we were allowed access to the grounds to see if we could find evidence of a boundary and, in particular, evidence of a strange 'kink' at the rear of the garden. Sadly, no 'kink' evidence at all and nothing to really suggest an ancient boundary. The land levels between this property and next door (Heronwood) showed a difference but this could be due to gardening methods. The only item of great interest was a beautiful Beech Tree 632 in the grounds of 25 and this was very close to the boundary line. It has a girth of 4.6m, in excellent condition and one of the best Beech trees in the parish. 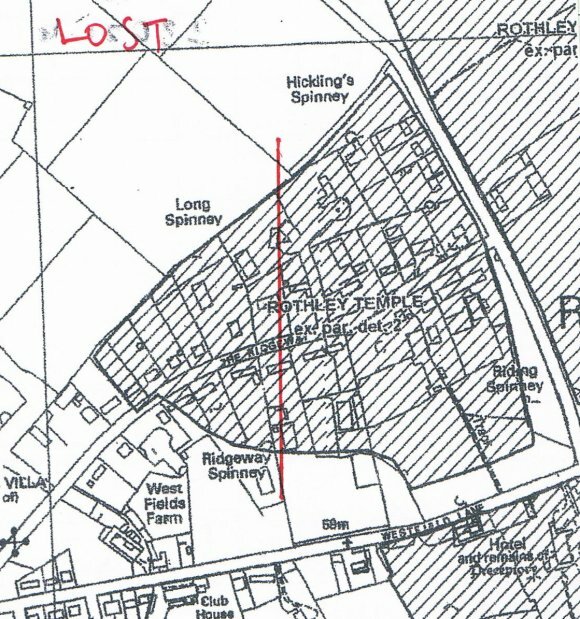 At the end of this part of the Rothley Ancient Temple Survey (RATS) we meet up with the Rothley Ancient Parish Survey (RAPS) at the end of Stint 18d. To meet up where we started at RATS Stint 1 we need to work back through Stints 18,17,16,15,14.